Give your favorite sponge a bath with this newly-formulated liquid blendercleanser. Made especially for soaking out tough stains, blendercleanser will keep your beautyblender – and brushes – squeaky clean! 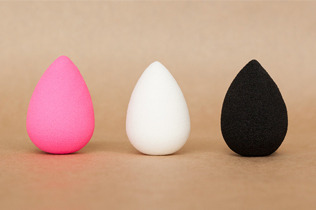 Use a damp beautyblender and press on the pump nozzle, distributing cleanser onto the surface of the sponge. Lightly squeeze and work into a lather. For stubborn stains, pour a small amount of blendercleanser into a bowl with water and let it soak for a few hours. Remove excess water and place beautyblender in a clean ventilated area to dry. This is the only cleaner you need for your BB! I have used the solid cleanser I have tried Dr. Bronner's. I got the liquid cleanser in mail today the first time I rinsed 80% of the foundation and stains where gone the second time it was like new. A month of use erased in two lather rinse repeat cycles, I don't think you can ask for more than that for value for money. Keep on mind I wear MAC NC45 studio fix fluid foundation its not exactly light work for the sponge. Don't skimp on the cleanser!! I haven't found anything to truly clean my beautyblender sponge the way this cleanser does. All you need is a dime sized amount on a wet sponge, rub it around into the sponge, and it cleans the foundation out. This is definitely a necessity! I don't have a blender, but I love this as a brush cleanser! It works beautifully! It even magically cleaned a sponge I've had forever and have never cleaned. It got my makeup brushes so clean so quickly. It doesn't smell great, but that's not a big deal. Previously, I have used e.l.f. 's brush cleanser, which is ok and very cheap; however beautyblender's product works much better. I definitely recommend it! This is a must for anyone that owns a Beauty Blender or any make up sponge. 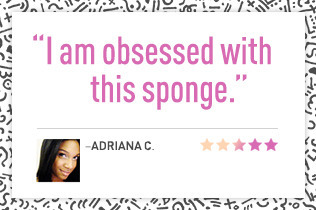 The cleanser helps remove all the access foundation that is stained on the sponge. Don't be afraid when you first wash your sponge and you have a sink full of pink water. It's just the pink dye from the sponge. Completely normal. One thing that I love so much about this product is that it leaves behind such a sweet calming scent in the sponge when washed and dried. Just smells so good. Also this is great for cleaning make up brushes too. Absolutely a must have for any beauty blender, sponge, or even brush owner. I bought the set that comes with two full size beauty blenders and a 1.5 ounce cleanser. I've tried washing my beauty blender with dish detergent, baby shampoo, and even dr bronners soap. It does not feel the same using these cleansers. The beauty blender cleanser not only smells good but does the job with a small amount. This is the best cleaner hands down for your makeup brushes and spunges, it gets all the creams from deep inside. The absolute BEST sponge / brush cleanser! This cleanser is the absolute best I have tried. It completely rids sponges and brushes of any trace of makeup! It smells absolutely lovely and the product goes a long way! I really like this product. It cleans all of my brushes and my beautyblender in no time. All you need is a dime sized amount depending on what you're cleaning. It takes off any stains I might have on any of my brushes and sponges. The only thing I don't like about it is the smell. It really doesn't have the best smell. But hey? If it cleans my stuff the way I need it clean, then I'll be good!